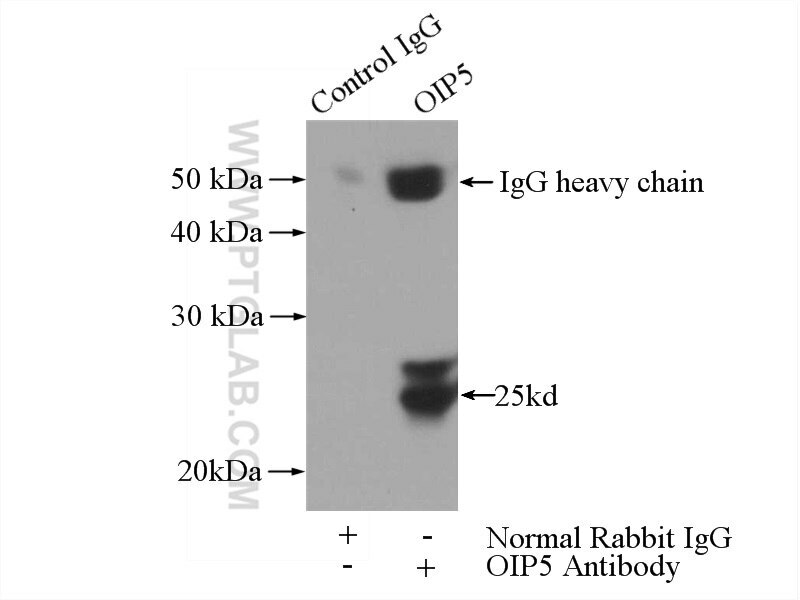 IP Result of anti-OIP5 (IP:12142-1-AP, 3ug; Detection:12142-1-AP 1:500) with Jurkat cells lysate 3200ug. OIP5, also named as IS18B and CT86, is required for recruitment of CENPA to centromeres and normal chromosome segregation during mitosis. It is over expressed in the majority of primary lung and esophageal cancers. OIP5 is a promising target for developing new prognostic biomarkers and anti-cancer drugs. Mitotic regulator Mis18β interacts with and specifies the centromeric assembly of molecular chaperone HJURP. Opa-interacting protein 5 modulates docetaxel-induced cell death via regulation of mitophagy in gastric cancer. Overexpression of Opa interacting protein 5 increases the progression of liver cancer via BMPR2/JUN/CHEK1/RAC1 dysregulation. Docetaxel-loaded solid lipid nanoparticles suppress breast cancer cells growth with reduced myelosuppression toxicity. OIP5, a target of miR-15b-5p, regulates hepatocellular carcinoma growth and metastasis through the AKT/mTORC1 and β-catenin signaling pathways. Characterization of an Opa interacting protein 5 involved in lung and esophageal carcinogenesis.